economist, politician, public affairs consultant and academic, has extensive experience both in the Irish private and public sectors, in Irish politics, and as an activist in the European arena. He is the founder and current President of the Institute of International and European Affairs (IIEA) a leading European think tank on European and International affairs. Brendan Halligan trained and graduated with a Masters Degree in Economic from University College Dublin in 1964. He worked in the public sector before entering politics in 1967, when he became General Secretary of the Irish Labour Party. During his political career, he served both as a member of the Irish Senate (1973) and as Teachta Dála (TD), or elected member of the Irish Dáil (parliament) three years later. 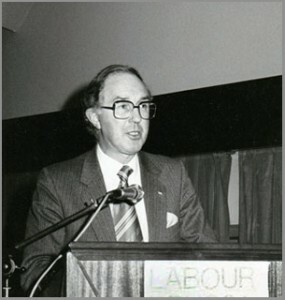 He continued in his role as the General-Secretary of the Labour Party until 1980, and later set up his own consultancy firm, Consultants in Public Affairs (CIPA). He was appointed as a Member of the European Parliament (MEP) from 1983 until 1984, where he specialised in economic affairs and energy policy. He acted as Chairman of Bórd na Móna (the Irish Peat Energy Authority) for ten years, and was also Adjunct Professor in European Integration at the University of Limerick. From the early 1960s, Brendan Halligan has been a passionate advocate in the fields of both European affairs, and sustainable development. For seven years, he served as Chairman of the Sustainable Energy Authority of Ireland, and he is currently a director of Mainstream Renewable Power. He was director of his own firm, Consultants in Public Affairs (CIPA) from 1985 to 2014, which served both the Irish and International public and private sectors. Currently President of the IIEA, he frequently delivers papers and lectures, some of which can be seen on the publications page. Brendan is a keen scholar and speaker of the Irish language, and holds an honorary Doctorate of Letters from University College Dublin.